Scaling & Root Planing The upper level of infection in the pockets around your teeth can be removed using specialized instruments. This procedure is called, "Scaling and Root Planing," "Phase One Treatment" or "Initial Therapy." It is done under local anesthesia and is quite different from the routine dental cleaning that is traditionally done in the general dentist's office. In our office this non-surgical procedure is usually performed by the periodontist. When periodontal disease reaches this lower level, it dissolves the bone around the teeth and can lead to bone loss. Once the infection has been removed, by closing the surgical site and repositioning the gum tissue. Where possible, bone damaged sites will be evaluated for bone grafting in an effort to regenerate lost bone. 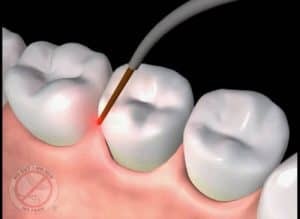 Laser Assisted New Attachment Procedure (LANAP) is a new therapy that allows for the effective treatment of periodontal disease with no removal of tissue. LANAP treats advanced gum disease. It is performed with a laser and may result in less cutting and stitches. This means there is a shorter healing time, less discomfort, and improved clinical results. Using a precision laser, your periodontist is able to kill up to 99% of the disease causing bacteria in the periodontal pockets. Because there is no defense against the laser, the bacteria can not adapt and avoid elimination as with anti-biotic treatment.